One of the donation projects I've decided to work on this year is called The 70273 Project. Jeanne Hewell-Chambers is gathering 70,273 quilt blocks to commemorate the 70,273 disabled people deemed "an economic burden on society" and murdered by the Nazis in 1940 and 1941. 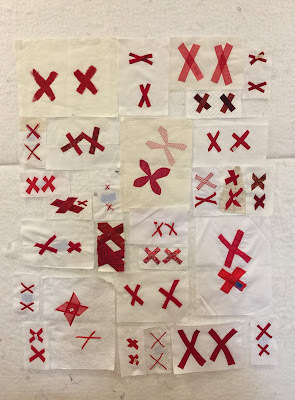 Each quilt block has a white background and two red X's to signify the two red X's placed on someone's file when Nazi doctors determined that they were "unfit" and sealed their fate. You can find more information at her website here or on her Facebook page here. 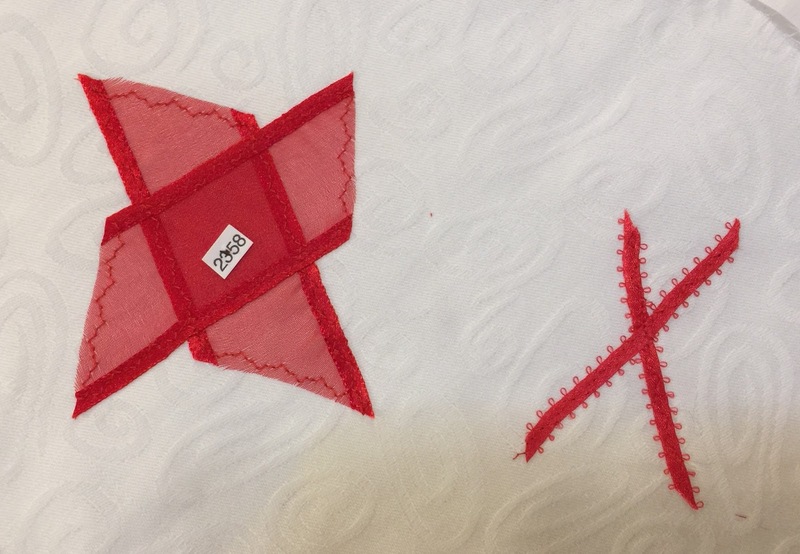 I volunteered to sew some blocks together and two sets came in the mail the other day. You should see how well documented this project is. 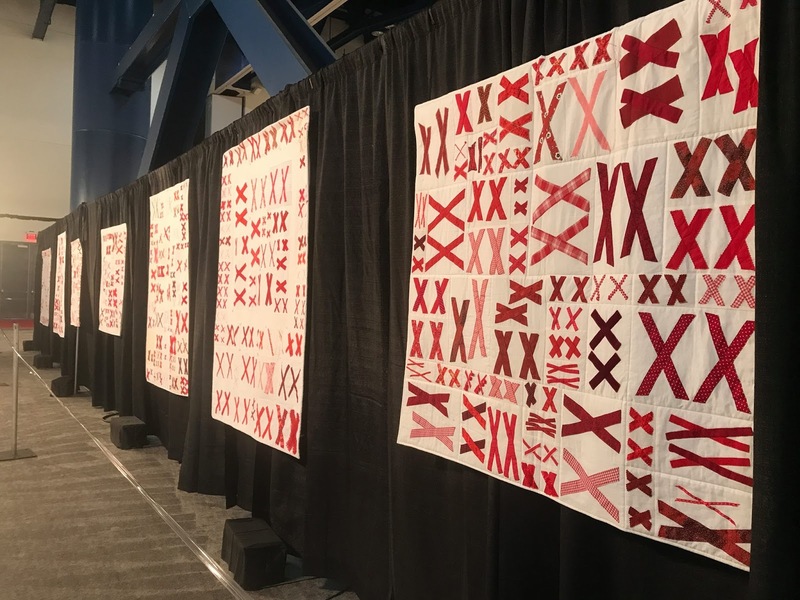 Each block donated is assigned a number, and each quilt is numbered. A record is kept of who made each block as well as who quilted each quilt. Today I started putting blocks together for quilt number 409. I settled on a layout knowing I would have to increase the size of some of the blocks to make it work. I found a ziploc bag full of small white scraps in my stash that will come in handy. 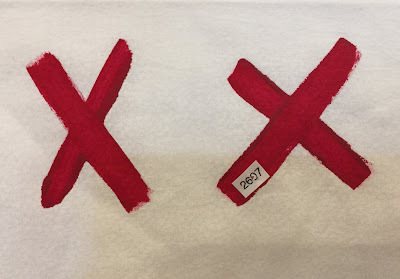 See why quilters don't like to throw out odds and ends of fabric bits? I only got the first row put together today, but I think this is going to go quickly. Look at this photo from The 70273 Project Facebook page (used by permission). It shows just a few of the quilts on display. Just as soon as I get quilt 409 and 410 pieced I'm going to volunteer to do more. I would definitely like to make at least one entire quilt this year for the project. Please check out the website and Facebook page for more information and to see if there's some way you can help. Great to see you doing this! 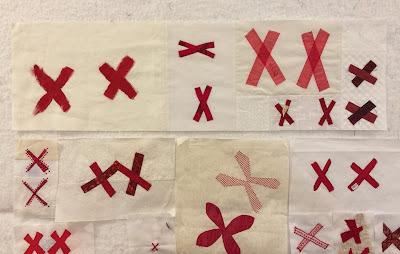 I started working on blocks and then put a challenge to our quilt group to make blocks. We made enough blocks to make our own quilt, which I sewed together, then my long arm friend (and quilt group member) did the quilting. 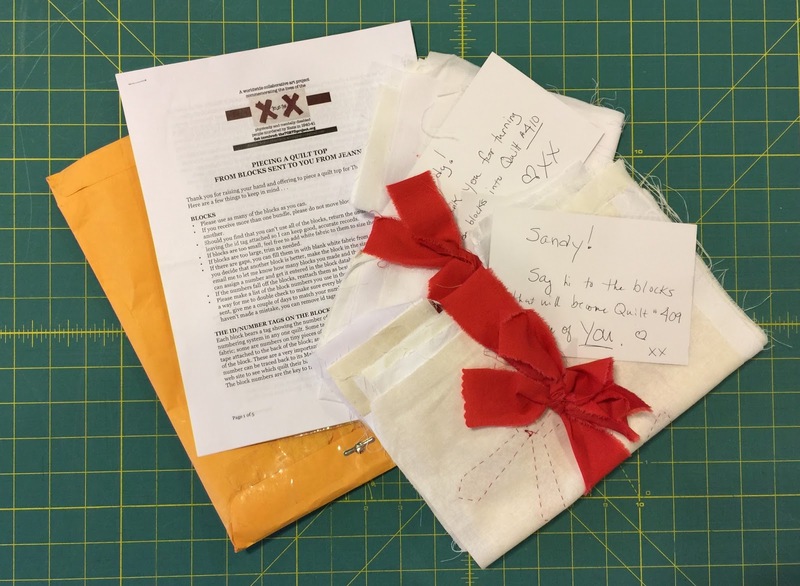 It was really fun to send the quilt to Jeanne! Your quilt top is coming along nicely! It's quite a concept, isn't it? There are many moments in history we have no words for. We can't even quite imagine it. But each of us needs to remember so it doesn't happen again. I had not heard of this project yet. I'm so glad you posted about it. I want to do some work on it, too, as it hits me in a compelling stir. Are you going to quilt these yourself? I'd be happy to quilt them up if you're not. Otherwise, I'll contact the coordinator to find out how to get a top or two to quilt. Interesting project. I look forward to see how yours turns out. These are beautiful and meaningful quilts! I love the huge variety of blocks. It was a terrible moment in history, and this project helps us to acknowledge and remember the horror. I had not heard of this either, but wow....do I say these quilts are beautiful or just think about the meaning with some awe? I had not heard of this project either. It's quite an undertaking. Very simple blocks, but they have a lot of impact. This is the first I've heard of this project. How big does the quilt have to be before it gets quilted? Are the red Xs made only from fabrics or were there some ribbons sewn down too. Wow. What a project. 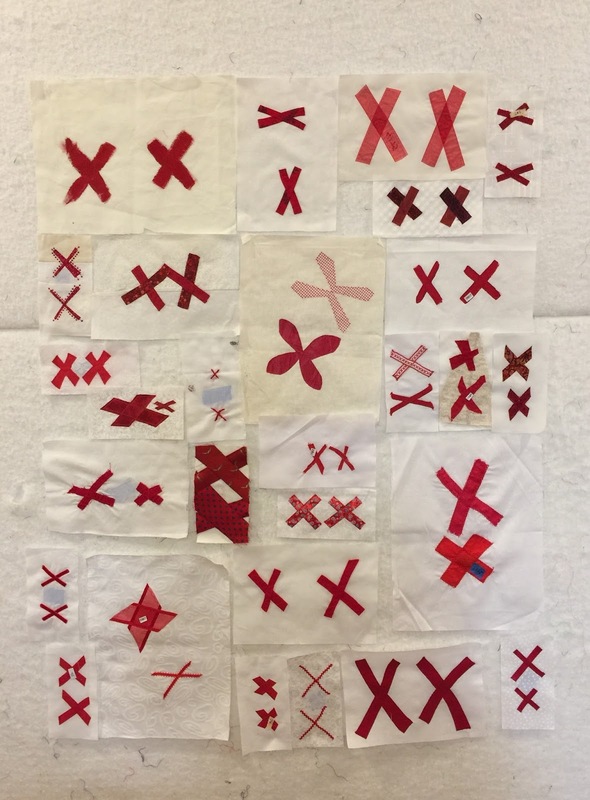 The quilts are fascinating in themselves but the concept is a thought stopper. When these are all together in one place the effect is going to be so powerfully sobering. Thanks for sharing this.